"WHY DO I ALWAYS GET THESE ****ING TEAMS," our Jungler rages not, even three minutes into our League of Legends match. "****ing stupid [Kassadin] you just lost lane and top is going to feed." The game is hardly over. We're just in a small hole, but the Summoner playing Lee Sin has already written this match off as a loss. Just a few seconds later they start again, "Top and mid already lost, my red got stolen, yeah im done." A couple matches later, I queue into another ranked match. Again, I find myself doomed to deal with toxic teammates. Our mid-laner is losing hard. Top is doing their job, holding off the opposing champion. But since our mid is getting dominated, he begins to reach out for help, and when those pleas aren't answered immediately, he starts his tirade. "Come mid you ******," he says as he continues to get forced out of lane. "****ing idiot, stay top like a ******. [Good job] throw [the] game, ****ing moron." He continues to rage, verbally assaulting other members of the team and generally only exacerbating our problems. We'd lose yet again, mentally drained from not only the effort put into turning the boat around, but also because of the taxing effect of a player who just doesn't know when to hold their tongue. Situations like these aren't all that uncommon in League of Legends. It often feels that when you aren't playing with four other friends, chances are you're going to run into the scum of the earth. Sure you can just mute them, but once someone starts to act this way, it's immediately reflected in their play. The word "toxic" is one found in many LoL players' vocabulary regardless of their actual standing in the game. Many offenders will remain unapologetic while those around them are forced to deal with their shenanigans until the match is over. 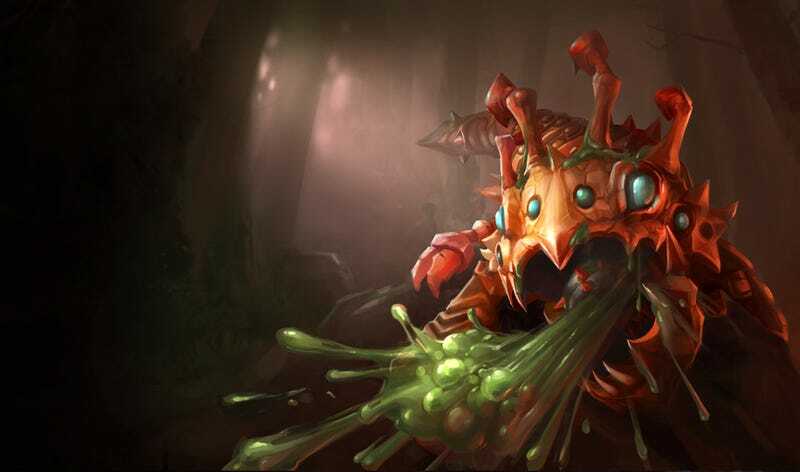 And due to the team-centric and lengthy nature of the MOBA genre, players often must put up with the toxicity for up to an hour, dealing with those spewing profanities at them, only to still suffer defeat in the end. The tools that Riot relied on in the past to promote better behavior have frequently failed as the game has increased exponentially to its current 20+ million player population. According to Riot Games, experiences like mine are not the norm, despite what many in the community think. Earlier this summer, Riot's Jeffrey "Lyte" Lin, the company's lead designer of social systems, pinged the official League of Legends forums looking for volunteers to be highlighted as a positive player. Knowing that my account was in good standing, I replied. Seeing my reply, Lin went and examined my own match history and found that in my last 100 games I had met a whopping 900 players and only four of them warranted chat restrictions. A single person was banned. This was surprising. At least half of my matches are overwhelmingly negative, at least in my memory. Perhaps some of this is due to the gruelingly long nature of League of Legends matches. Regardless of whether it's a win or a loss, most matches take a decent amount of mental fortitude. It seems rougher when I venture into the Ranked Queue alone, only hoping that all four others on my team won't jump down my throat the first chance they get. Lin described this phenomenon of remembering bad experiences, "There's a psychological phenomenon called negativity bias," he said. "People tend to recall negative events more prominently compared to positive events. In fact, some scientists suggest that you need about four positive events to equal the impact of one negative event." If this is indeed the case, and not just Lin downplaying things, Riot needs to figure out a way to emphasize those four positive events and minimize the poor experiences. The tools the developer relied on in the past to promote better behavior have frequently failed as the game has increased exponentially to its current 20+ million player population. A system called The Tribunal had been used to handle all reports made by players. In it, players who were level 20 and above could review chat and game logs before voting on whether or not they think the issue should be acted upon. If enough people believed it was a punishable offense, the system would initiate a minor infraction such as a chat ban or Riot would act upon it. Otherwise, the report would be dismissed and the offender would never know they had been reviewed. Response time was slow. The Tribunal was lenient. Lin took up the efforts to overhaul the player discipline system. "Our research shows that players do understand what's crossing the line, and most players believe it's unacceptable. The behavior we're hoping to address with our systems is that some players understand what's crossing the line and believe it's ok, because other games never punished it in the past." While "most players" might understand that their actions aren't okay, the main issue with this viewpoint is that Riot defines what is and isn't acceptable. In general, many of the LoL players I know take up a zero tolerance policy. Seeing someone say "That's gay" was all it took for me to hand a report over to Riot the other day. With a community that's not afraid to tell you to go ahead and kill yourself if you're not playing the way they expect, there's certainly room for improvement. "We know that we have a long way to go," Lin admits, "but the data shows that we've made progress in addressing the most negative players." Lin: "We see about 2% of players [in the Tribunal] refuse to reform regardless of the consequences." Riot is focused on reform, not punishment, and while that is a noble cause, in the meantime players are forced to deal with those who Riot says are struggling to change their ways. There are times when someone's issues are so deep-rooted that there's nothing to do other than ban them, and we're all thankful for that, but Lin believes that some people may just need some encouragement to improve their behavior. "[W]e really need a full spectrum of systems," Lin said in a message on the League forums. "We're always going to need systems that address persistently negative players who engage in racism, sexism, homophobia or excessive verbal abuse and refuse to change—we need to get these players to just take their time elsewhere because they don't belong in our community." That said, he continued, "Players join League from a variety of different backgrounds; everyone has a different culture, education, family background, gaming background and more...We need systems to educate these players that [the aforementioned violations are] not OK in League, and they'll improve their behaviors and make the community a better place." It's possible the Riot team simply doesn't see as much toxicity as regular players. They're mostly isolated from these situations. No one dares attack developers in their own domain. I've been in games with multiple members of the development team, and you better believe that everyone is on their best behavior. It's not like that when they're not around. The Tribunal did a good job at helping the community police itself, according to Lin, but what it couldn't do was adequately deal with repeat offenders who failed to change their ways. "For the majority of players (74%) [of those ever punished under that system], the first warning in the Tribunal was enough for them to improve their behaviors," he revealed. "[Most] players improve their behaviors after the next tier ban, but at the end of the day, we see about 2% of players [in the Tribunal] refuse to reform regardless of the consequences." Lin: "As of 8/22/2014, homophobic and racial slurs are used in 1% of games. We've come a long way in reducing the amount of homophobic slurs, racial slurs, or sexism in the League community. We've seen a rise in positive language as well." Riot is trying to create new systems to address and escalate bans before the perpetrator has the opportunity to continue their acts. "We've seen that players who tend to be consistently severe in their behaviors tend to never reform, which is why we built a machine-learning approach to try to identify these patterns...[to] try to identify those players, and immediately escalate their bans to the highest tiers." While this is certainly an improvement appreciated by everyone who's passionate about the game, Lin admitted that Riot's old system simply wasn't harsh enough, "By giving the worst 2% so many chances, we're actually letting them ruin a lot more games and players' experiences and that's something we want to try to reduce." Lin said that player behavior is getting better. "As of 8/22/2014, homophobic and racial slurs are used in 1% of games," he told me. "We've come a long way in reducing the amount of homophobic slurs, racial slurs, or sexism in the League community. We've seen a rise in positive language as well, with 98% of games ending with "GG" [Good Game] or "GGWP" [Good Game Well Played]. At the same time, the phrase "BG" [Bad Game] has dropped to 3% of games." In the meantime, though, the team is also working on new ways to encourage positive behavior and discourage those who seek to ruin the experiences of others. "For all players, we need systems that focus on positive reinforcement," Lin said. "We need to show players what it means to be a positive member of the community, and we need to give players more reasons to be good. We need to make 'being good teammate' the easiest choice in every situation. We need to create tools for these players to shape the community for the better, and help cast out the negative players who contribute to the negative perceptions. Sticking to his focus on accolades for those who are constructive in their demeanor, Lin described the new Tribunal. "However, we're also working on a new [update] that allows players to review both negative and positive behaviors—and even have the ability to reward players for their positive behaviors." Lin wouldn't divulge specifics but—just speculating—we'd possibly see the usual rewards, a certain skin or champion if you've been in a positive standing for a very long time or maybe something as simple as IP [in-game currency] boosts for every month you aren't reported. There is some amount of dissent in the community as to why we see much more dissuasion than we do positive reinforcement and Lin admitted that this is the case, but just a situation that arises out of his team's approach. "There's more in the works that we're not ready to talk about yet, but they are a mix of both punishment and reward systems. "It just so happens that, recently, some of the punishment systems are going through testing and closer to 'done' than the other stuff—so, it may seem like we're only making punishment features or you may perceive that we think we only need punishment in League, but that's false. "We've always known that we need systems that address both punishment and rewards; however, we jump back and forth between the two types of systems depending on what we think the next piece of highest value is to players." Because of the nature of League of Legends patches, you never know exactly when these systems will be available. It could suddenly drop one day or it could sit on Riot's public beta environment (PBE) for several months as it goes through testing. For now, fans of League of Legends will keep chugging on, trying to make the best of every situation presented to them. Dillon Skiffington is an avid League of Legends player, eSports fan, MOBA connoisseur, and most of all a caffeine addict. He's always open to discussing any of the above and more over on his Twitter account. Disclosure: The author is a contributing writer for Leaguepedia, a website owned by Team Curse. He formerly had been contracted to write for LoL eSports, a site owned by Riot Games.